Scientific Notebook Version 5.5 is ideal for reports, homework, and exams. With Scientific Notebook, creating attractive documents that contain text, mathematics, and graphics is seamless and easy. Version 5.5 includes RTF export, enabling you to share your work with colleagues or friends who do not have Scientific Notebook. Entering text and mathematics in Scientific Notebook is so straightforward there is practically no learning curve. Formatting is fast, simple, and consistent, since it is done with tags that define the document structure and appearance. The software comes with reference manuals and an extensive online help system for creating documents and doing mathematics. If you need additional help, MacKichan Software provides reliable, prompt, free technical support. 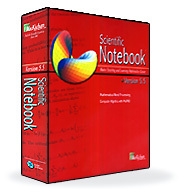 Scientific Notebook is supplied with the built-in computer algebra engine MuPAD® 3.1. You can solve equations right in your documents with our easy-to-use interface. You don't have to master complex syntax to be able to evaluate, simplify, solve, or plot mathematical expressions. Full computer algebra capabilities are available. You can compute symbolically or numerically, integrate, differentiate, and solve algebraic and differential equations. With menu commands, you can compute with over 150 units of physical measure. You can import data from graphing calculators. In addition, you can use the Exam Builder provided withScientific Notebook to construct exams algorithmically and to generate, grade, and record quizzes on a web server. With Scientific Notebook Version 5.5, you can create 2-D and 3-D plots in many styles and coordinate systems, and enhance the plots with background color, grid lines, and plot labels in specified locations and orientations. And with MuPAD's VCAM you can animate these kinds of plots: 2D plots in polar coordinates, 2D and 3D plots in rectangular coordinates, 2D and 3D implicit plots, 2D and 3D vector fields, 3D tube plots, 3D plots in cylindrical coordinates, and 3D plots in spherical coordinates and vector fields. View all your plots in the VCAM window with playback toolbar controls. Use your mouse to start, stop, re-run, and loop animations. Define an animation variable t for your plot and specify the animation start and end times and the rate of frames per second. With OpenGL 3D graphics, you can rotate, move, zoom in and out, and fly through 3D plots. If you have Internet access, you can open the file at any URL address from inside the software. WithScientific Notebook, you can send mathematical documents containing text, equations, and plots over the Internet. Scientific Viewer, our free web browser, makes the exchange of technical documents a breeze. The software supports hypertext links, so you can facilitate navigation for your readers through a series of related documents. Readers can view and print documents using Scientific Viewer. With the external lookup feature, you can access or run external programs, such as a search engine or other application, directly from your Scientific Notebook document.